"Okay, karma person or thing…whoever’s in charge of this stuff…if I can just get out of this situation alive, I will give up meat…and sarcasm. Okay? That’s all I got. That’s pretty much my whole identity." 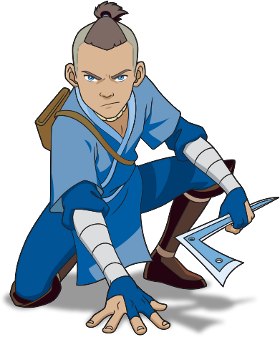 FULL APPEARANCE: A teenager of average height, Sokka has medium brown skin coupled with blue eyes that might be ordinary enough back home, but are striking and memorable in the outside world. He usually wears blue, loose fitting clothes that let him move around with ease, but he's happy enough to wear whatever will blend in wherever he is. Surprisingly, Sokka can actually be a bit of a shopaholic, so he'll pick up and wear fashionable baubles from all over Pern, not always in compatible combinations. Sokka's weapons of choice are the boomerang and the sword and he carries both with him wherever he goes. His boomerang comes from home, a gift from his gran-gran, while he forged the sword himself with the help of a mastersmith he spent some time working with as a candidate. He is fairly competent at using both and pretty athletic in general, although he does have the occasional moment of clumsiness. PERSONALITY: Most of the time Sokka is...a total goofball. He likes making bad jokes, eating good food and just generally having a good time. Random time-wasting shenanigans? Sokka's your guy. He's all up for flirting with pretty girls, dancing badly, going shopping, whatever sounds like fun. And he's not afraid to embarrass himself. He might blush or complain, but if he has to wear a dress to get into a poetry reading and flirt with the Lord Holder's daughter? Pass over the skirts and the makeup. That said, when things get serious, so does Sokka. He takes his responsibilities to heart, whether it's to his friends, his weyr or to his dragon. And when things go badly, he'll take it hard, no matter how much or how little of the blame is rightfully his. Sokka has the potential to be a good leader in his own way. He's smart, hard-working and willing to think outside the box. But he still struggles with a fair amount of insecurity and public speaking? Not his best arena. Sokka tends to trust his instincts in most things and those instincts tend towards caution and rationality in matters of danger and importance. He's not the most trustful of strangers and tends to generalize groups widely considered dangerous or untrustworthy. He's also less than comfortable with touchy feely stuff and tends to scoff at anyone who wants to leave things to faith or believe in the power of love or anything of that nature. He also used to be a bit of a misogynist, but since his arrival at the weyr, has largely come to realize that there are plenty of women who fight and ride as well as he does. While he may still make the occasional ill-advised comment at times, especially to his sister, he's largely learned when to shut his mouth. SIGNIFICANT OTHER: Suki!! !...if she ever realizes he's alive. Someday it'll happen! HISTORY: Sokka was born in a small seahold, on the coast near Ista Weyr. He was his father's eldest son and heir, raised to fish and sail and eventually to lead, the war no more than a distant shadow at the back of his mind. But his peaceful existence wouldn't last. When him and his sister were still small children, riders from High Reaches Weyr attacked, killing his mother along with many others and taking much of the hold hostage. Sokka and his sister survived, thanks to Kya distracting the riders long enough for them to escape to the sea. His father and some of the other men left for Ista Weyr soon after, planning to aid in the fight in any way they could and try to negotiate the return of the hostages. The war ended soon after and some of the men returned, but not Sokka's father. High Reaches continued to hold on to some of their neighbors, claiming they were candidates or handlers or riders or needed to work the Lower Caverns. His father spent turns trying to ensure their release. All the while Sokka was left nominally in charge, while Hakoda continued to run the hold from afar with the help of his mother, Sokka's gran-gran Kanna. Thus Sokka grew up with a heavy sense of responsibility on his shoulders. He had to help keep the hold fed, for they were too small to accommodate idle holders. He tried to train the boys and men to fight, for all any soldiers of great ability had joined the ranks of Ista Weyr or gone traveling with Hakoda. Most of all, he wanted to live up to Hakoda's expectations. While he may only have seen the man rarely, as Hakoda spent most of his time traveling Pern in search of their lost ones, his example weighed heavily on Sokka. When Sokka was fourteen, his father finally returned home in disgrace. After High Reaches and Fort came to a lasting peace, Hakoda had traveled to the weyr to see for himself what the war had wrought. Many of their missing were long since dead, of plague or accident or killed in battle, and most of the rest had scattered to other weyrs and had no interest in returning to the small seaside hold they hadn't seen in many turns. Hakoda was home, but he was changed, a faint remnant of the powerful, confident father Sokka had always known, tired and worn out from turns of useless fighting. It couldn't end like that. Sokka wouldn't accept it. And so at the age of 15, he entered Ista Weyr as a Candidate, determined to succeed where his father had failed. He had always had a love for tinkering with machines, so he joined the Smithcraft when asked to pick one. And as soon as he was able, he transferred to High Reaches, determined to right the wrongs that had happened on his watch. Sokka didn't find his missing holders, but the more time he spent in High Reaches, the more his opinions of the weyr softened. He learned there were good people there, also struggling to recover from Golre's range of terror, trying to do the right thing, the same as he was. He even found a mentor in a master smith named Piandao, who had once armed the riders who destroyed Sokka's childhood, but was now willing to teach Sokka his trade. And so, when he Impressed Green Wintrath, he didn't cry or rage. He smiled and swore to do right by her and by Pern. Because what sort of a rider would he be if he abandoned the one who needed him most? His family's honor would have to wait just a little while longer. Late Fall, 2766- Wintrath is run into by Suventh, and Sokka's left thigh is badly bruised in the crash (Moderate) while Wintrath's head is accidentally clawed and scraped (Mild). Early Spring, 2767- A large clump of Thread blows aside at the last moment, and Wintrath's flame fails to catch it. It instead catches Asuka and Ayanath, scoring both of them badly; Ayanath goes between only moments later and does not reappear (Fatal). Wintrath, distracted after what happened to Ayanath, fails to notice another clump of Thread. Both of of her wings are badly scored, but will heal in time. Possibly a long time (Major). They decide to start chewing firestone and give up on the idea of clutching. Early Fall, 2767- Wintrath and Cuccoth collide when both try to approach the same clump of Thread. Wintrath's left hind leg is scored by the Thread that neither could flame, and her left wing is broken in the collision; further bruises occur when the dragons eventually crash-land (Major). Sokka is miraculously unharmed. Sokka resolves to give Wintrath firestone as soon as she's healed. Early Fall, 2767- Sokka agrees to Search a candidate, Dobby, for a Benden bronzerider in exchange for firestone he can receive and use with no questions or recriminations. And with that- Wintrath is no longer a clutching green. You are mine and I am yours. Together, we will go far. FULL APPEARANCE: Wintrath is a rather soft shade of pale green down the length of her long, winding body. Across her hide is an almost white set of markings which look remarkably like frost. 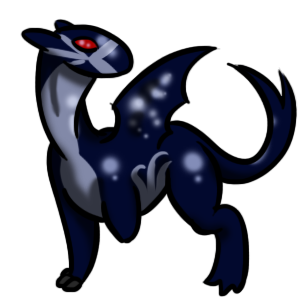 The pattern can be found predominantly all over her body - on her face and headknobs, hindlegs, the base of her tail, as well as on both sides of her wingsails. It gives her an almost patchy look, something that seems to suit her particularly well. She is built small, from compact musculature to tiny yet perfect limbs and wings; despite this, she is fast and she is able, willing to take on any task and show she can complete it with no issue whatsoever. PERSONALITY: Wintrath is a strong personality. She's athletic with a good sense of endurance, able to withstand a lot before she feels the need to bow in. That said, she's an ideal second in command - with the judgement and advice of a leader, she can go far, especially in the way she communicates well with those below her that are entrusted into her care. She will often look to her rider for these instructions, or a 'lead' dragon, such as a Wingleader or Weyrlingmaster. She is able to step up and lead when needed as well, good at feeling out the strengths, weaknesses, and needs of a group of dragons or people. That said, she has a more easy going side to her, the calm or comic relief to the seriousness needed out of someone in charge of everyone. She has a serious side for the times it is needed, but she tries not to let these rule her entirely. She can be very laid back, willing to tolerate a lot and not becoming angry or upset; she's very patient. She's got a slight mischevious streak to her, though never pushing into the area of trouble or disturbance. She is a good bridge between her siblings, as well as other dragons, in that she gets along with everyone and can translate what people need to one another with a great sense of ease and understanding. She has a crude sense of human that can startle people from time to time, but really she's a giant teddy bear.